Although its watches don't run Wear OS, we've followed Withings closely for a few reasons. 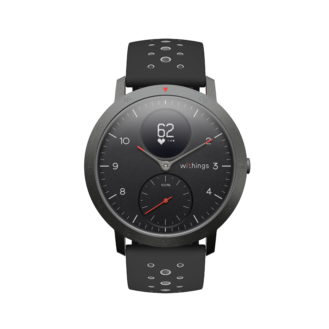 For one, it makes beautiful minimalist watches with some smart fitness tracking features added in (I own an Activité Steel and I love it). The French company has also been in the news a lot due to Nokia acquiring it, turning it into its Digital Health Division, and then selling it back to its co-founder. 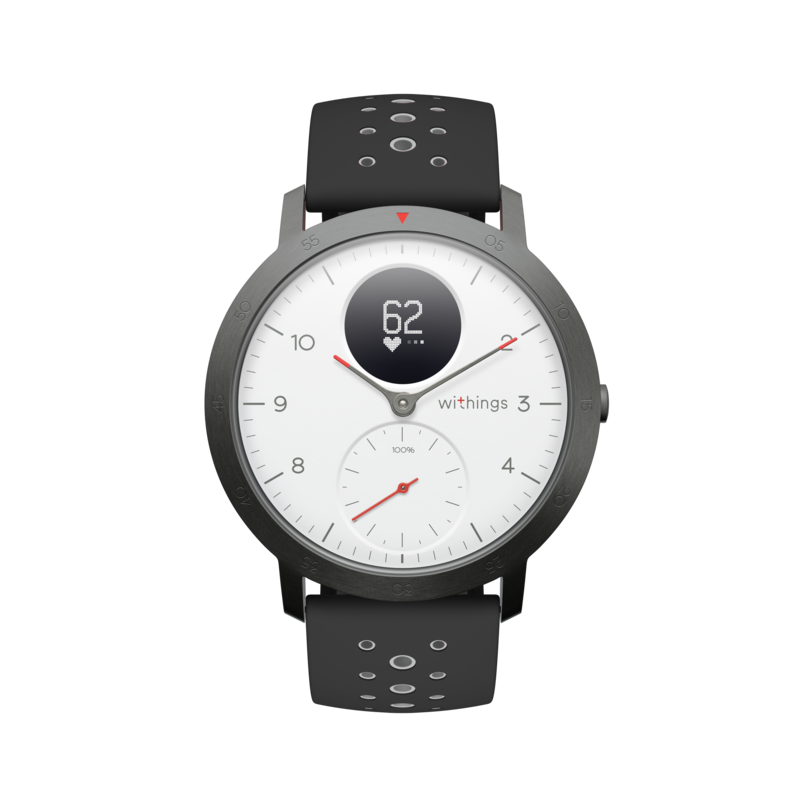 The first product to be released since all of that is the Steel HR Sport, another hybrid smartwatch with a small OLED display that can show your phone notifications, fitness data, and alarm settings, but this time it has more advanced activity tracking features. 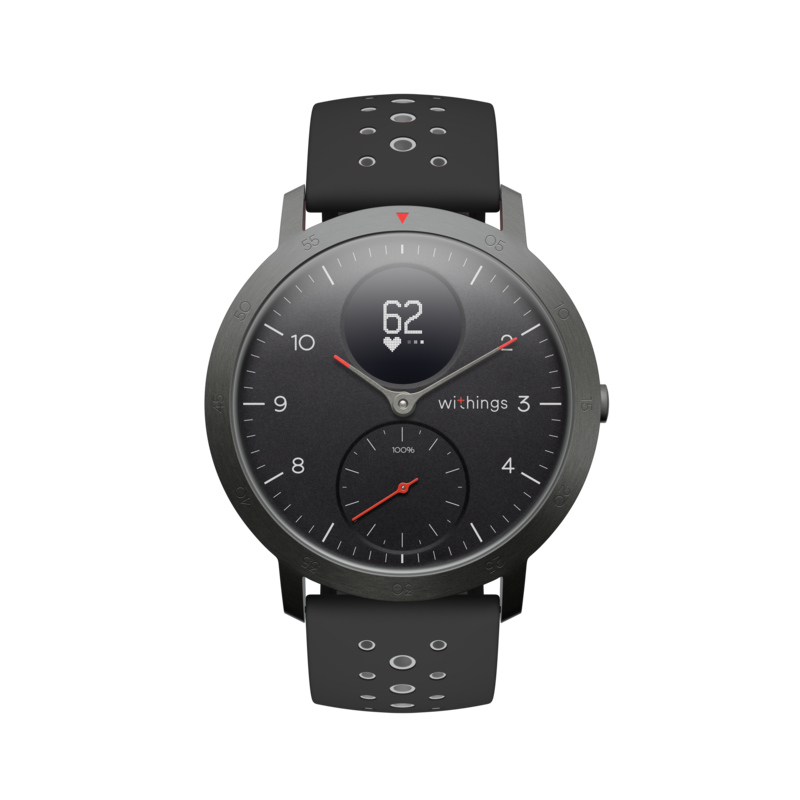 Withings' previous flagship watch added heart rate monitoring and that's on board again here, along with step tracking, sleep monitoring, and up to 25 days of battery life. The new Sport model improves upon its predecessor by including connected GPS tracking (when paired with a smartphone) and Fitness Level analytics (VO2 max estimation). Only one size is available for this version, and the 40mm case is made from 316L stainless steel. It's water resistant to 50m and can track swimming plus another 29 different sporting activities. White and black watch faces are offered, both coming with a gray drilled silicone strap — additional silicone or leather options can also be added. The Withings Steel HR Sport is on sale now and costs $199.99, just $20 more than the original Steel HR. As with previous models, you'll need the free Health Mate app to unlock its full potential. heart rate monitoring, connected GPS, and Fitness Level based on VO2 max measurement. blood pressure monitors, smart scales, thermometers and sleep tracking devices. original cofounder, Eric Carreel, buy back the business he sold to Nokia Technologies in 2016. With the groundbreaking launch of Activité back in 2014, the first analog watch with activity tracking features, Withings paved the way for all hybrid smartwatches to come. Steel HR Sport continues this tradition with a premium design blended with smart health and sport features for analytics. Its elegant design features 316L stainless steel and a 40mm case that is water resistant up to 50M (5ATM). Available in both white and black face variants, it is equally eye-catching in sporting or social settings. The analog face of Steel HR shows the time as well as a sub-dial that shows the percentage of daily activity goals achieved. Goals are set and managed within the Health Mate app. The device’s discrete OLED display shows important health and sports data such as daily steps, calories, distance and heart rate and can be navigated with a push of a button. The display also shows smartphone notifications, which appear automatically along with a discrete vibration. Steel HR Sport offers dedicated multisport tracking for over 30 different activities from yoga, volleyball and rowing to boxing, skiing and ice hockey. Users select the chosen activity on the watch display to start their workout session. During workout sessions, Steel HR Sport continuously tracks and displays heart rate and the duration of the workout directly on the watch screen. After the session, users can understand the intensity of their workout with heart rate zones and calories spent based on the specific activity selected. Steel HR Sport is the first product within the Steel HR range to feature GPS connectivity. Once paired with a smartphone, users can track their pace, distance, elevation and map their workouts while walking, running or cycling. Pace, distance and continuous heart rate are displayed on the watch face screen and can be tracked live on the user’s phone. After a session, the user’s workout route can also be viewed in the Health Mate app. The device is the first Withings product to offer Fitness Level assessments of its user. The fitness indicator, called VO2 max, measures the heart and muscles ability to convert oxygen into energy during physical exercise. The fitter the individual, the higher the VO2 max. Following running sessions, Steel HR Sport calculates the user’s personal Fitness Level using pace, heart rate and morphological data (age, weight, gender). This fitness metric will help users to optimize their training, increase performance and achieve long-term fitness objectives. consisting of eight weeks of recommendations to improve sleep patterns. During waking hours, Steel HR Sport helps users keep on top of their daily communications. capabilities, allowing a multitude of app notifications to be displayed on the digital screen. friends and family on social channels, notifications appear on the watch with a content preview. Steel HR Sport connects with the free Health Mate app, available both on Android and iOS.